Pledge® Multi Surface Wipes is the ONLY furniture cleaner that safely and conveniently cleans and dusts all kinds of surfaces in your home. With no need to keep switching products, this multi-surface cleaner makes cleaning and dusting easier than ever!Because today's furniture is often composed of multiple surfaces, including wood, glass, stainless steel, granite, and integral electronics, dusting and cleaning can become a real hassle. Not anymore. Now, with this multi-surface cleaner from Pledge®, there’s a convenient way to safely remove dust, fingerprints, smudges and smears from these multiple surfaces in your home. Plus the wax-free formula in this multi-surface cleaner leaves no residue build-up behind. 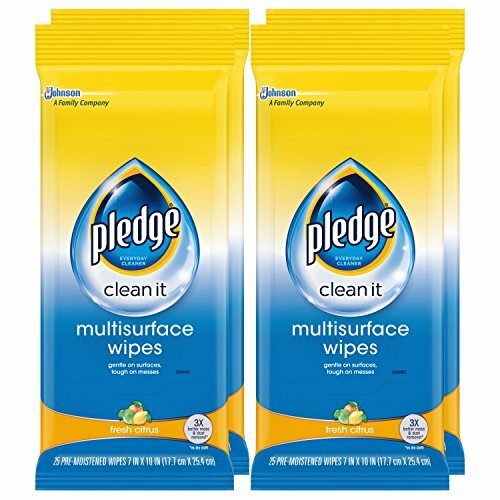 Dusting and cleaning multiple surfaces has become quick and easy with Pledge® Multi Surface Wipes.